The lovely Professeur Gothique has tasked her adoring readers with a homework assignment this month...but a very easy one for me to complete! The assignment this month is "Comfort and Joy" and sharing what makes us feel less frazzled during the stressful holiday season. I've been so focused on Creepmas and getting ready for the holidays that I didn't think I would have time to complete this homework assignment...lucky for me, Le Professeur accepts late homework! When I need comfort, there are a few items I turn to for instant joy. Whether I've had a long day at work, stressed out over driving (always an adventure in SoCal) or having a humbug, grinchy kind of day, I can always turn to any of the items below for an instant pick-me-up! 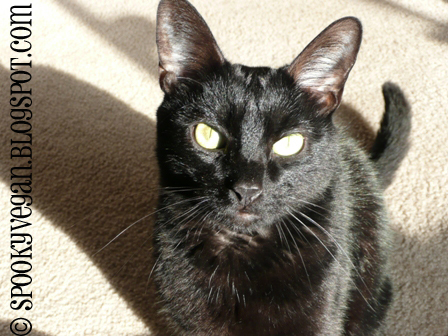 All I need is a good snuggle with my kitty-cat Havoc to know everything is right in the world! Petting him is one of the first things I do when I get home from work and it immediately gives me a warm fuzzy feeling and makes all my troubles seemingly melt away! 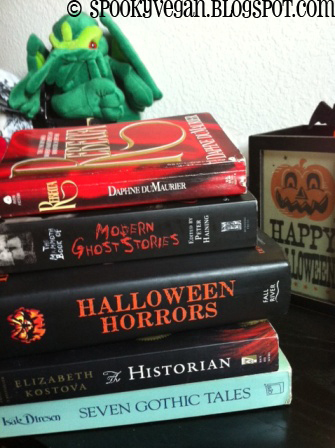 I am an avid reader, as evidenced by this stack of books on my nightstand. If it is one thing that can make me forget my troubles, it is a good book! I grew up without watching much television, so my nose was always buried in a book. My second home was the library! 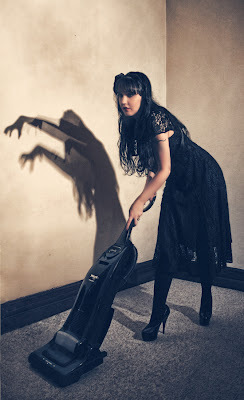 I love a good horror novel (I started reading Stephen King and Anne Rice in elementary school/junior high) and even used to review books (among other horror-related media) for my old site (Fatally-Yours.com if you're interested). However, I DO read other books besides horror-fiction as long as they have a darker theme. Little known fact: I also count the Lord of the Rings novels among my favorites! I don't know what it is, but cleaning totally zens me out. Whenever I am really upset, I start cleaning and the busy work takes my mind off of things, plus as I scrub away it works off any tension and aggression I'm feeling. Doing something productive like cleaning really helps pull me out of any funk! 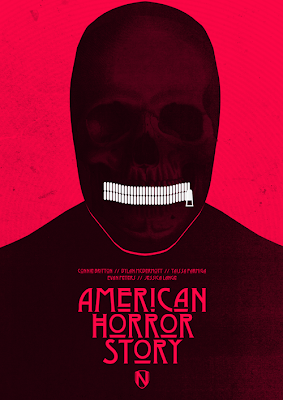 There is nothing like crashing on the couch and zoning out to my favorite genre - horror! I have over 1,000 DVDs on my own, but now with Netflix streaming and tons of video-on-demand titles, I pretty much have access to whatever I want to watch whenever I want to watch it! I have also been digging the horror-themed TV shows on air - new favorites include American Horror Story, Grimm and even Once Upon a Time! Old standbys include Supernatural, Fringe and The Vampire Diaries. drawing or spending countless hours online. Ahhhhh...I love a good cup of tea or mug of hot chocolate to really sink into pure relaxation! 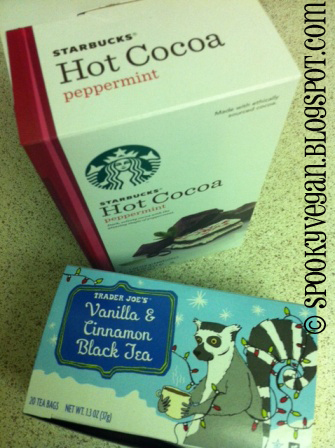 I found this yummy Starbucks Peppermint Hot Cocoa at the grocery store and thankfully it was vegan! Yay! It is usually hard for me to find cocoa mix that doesn't contain any milk products (ick! ), so I'm glad I found this! Hot chocolate is usually a special occasion for me, so I drink tons of tea, especially in winter. I discovered this Trader Joe's brand Vanilla and Cinnamon Black Tea and OMG it is my new obsession! I love this tea and it really helps me chill out...and how can I resist that cute lil' lemur?! Other things that bring me comfort and joy are lovely massages from Mister Spooky, my red flannel PJs, my heated blanket, talking to my family (or if I'm lucky, spending time with them when I get to see them) and taking naps! I love the photo of the cleaning lady! And Havoc. Cats should always top the list of comfort. We have so much in common! For starters, cleaning is my go to thing when I'm feeling down, just seeing my house (which is already clean) even cleaner and tidier, its just the most squeaky clean feeling EVER. 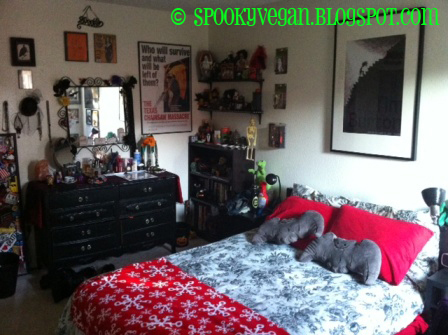 By the way I <3 your room, it is such a spooky haven, cute bat pillows, me want! I have those bat pillows, just their cute little faces help me XD I'm weird like that! hehehehe ... cleaning knocks the stress out of me too! I sometimes "angry clean" which knocks the anger out of me too -- a good thing to do when I'm PMSing! I LOVE your room!!! I have the same bat pillows! :) Thanks for participating! I love your room! I had to restrain myself from buying ALL the bat pillows. I wanted an army of squishy bats. Everything you listed I love as well. Especially the Trader Joe's tea. That black tea smells and tastes so good. @VictorianKitty - I completely agree about cats! @Mistress Aphrodite - There is nothing that relaxes me more than a squeaky clean house! @IntoxiKate - I know what you mean about the expression on the bats' faces! Their cheeky smiles always put me in a better mood! @Le Professeur Gothique - Thanks again for putting together this homework assignment! @Electrobat - I know how you feel; I wanted to keep buying more and more bat pillows! How squishy and cute would that bat pillow army be?! @MissRivett - The best thing about Trader Joe's teas (besides the yummy taste) is the price!! So much less expensive than the "name brand" teas! Whahahaha!? That cat is creeeeepy! Completely agree about cleaning. And you have the greatest cat's name. I have a bat pillow too! 13 Days of Creepmas: Merry Creepmas! 13 Days of Creepmas: Welcome to Creepmas!